Verken delen van Dubrovnik die toeristen gewoonlijk niet bezoeken door te toeren in een 4WD-buggy. Samen met een vriend stoot je over een deel van het ruige terrein buiten het stadscentrum, zoals een lokale ranch en een fort op een heuveltop. Een gids zal de expeditie leiden, ondersteuning, instructie en aanwijzingen geven; zelfs beginners zullen zich veilig en comfortabel voelen. This is a great activity to do if you're wanting a bit of fun and a break from the Old Town. Our guide was really friendly and helpful and made us feel safe throughout. The route is quite dusty and muddy in places but luckily we were given ponchos and hair nets to protect ourselves from the dust and mud. There was only three buggies including our guides on our tour which was good as it made it seem more personalised. For couples who are both wanting to have a go a driving the buggy, there is the opportunity to swap drivers half way around. Also just to note that the safari starts at the top of the cable car and so you need to purchase a cable car ticket to get there. Would recommend - lots of fun! We really recommend this trip. If you want some adrenalline rush you can find it here. Were black clothes or something you do not care about, because the dust from there doenst come out when you wash your clothes. We had originally a booking for 7pm, but we arrived early so spoke to the lady in the kiosk who switched us to the 6pm slot. We had no idea what to expect, but we were immediately put at ease by our tour guide everything was provided, including hairnets, helmets and goggles although we wore sunglasses because it was easier to see!. We were given a run-down of how to work the buggies, and then we were off. My friend and I drove for half an hour each, and in the middle we were given a photo opportunity over the city. The view was incredible, as with a lot of places in Dubrovnik! Be prepared to get covered in mud, and don't wear any new clothes/shoes if you don't want them getting dirty! 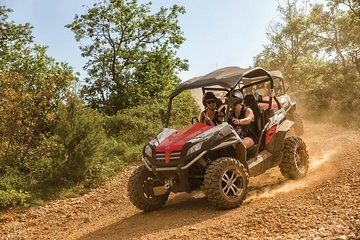 I would thoroughly recommend doing this buggy safari when in Dubrovnik, and I hope to be back some day! This was really enjoyable. A little bit on the pricey side - but great fun! this is a fantastic experience. fast paced and exhilarating as well as informative.